Sometime back L'Oreal came up with its New Color Riche Collection Exclusive La Vie En Rose which has 7 Velvet Mat Lipsticks, 5 Extraordinaire Mat Lip Colors and 3 Nailpaints signed by their ambassadors. To see the swatches of the lipsticks CLICK HERE. Today I will be reviewing 2 Lipsticks, 2 Mat Lip Colors and a Nail Paint . Packaging ~ Comes in a gorgeous black and gold matte packaging. It looks very classy and pretty. It also has a color sticker at the bottom. Color ~ Liya's Delicate Rose is a warm pink color and JLo's Delicate Rose is a berry color. Both the colors have very fine milled shimmer but doesn't show on lips. Also the color looks different in the bullet. But is sheerer when applied. Fragrance ~ These lipsticks smell like Lakme Enrich Satin Lipsticks and I am not very find of the fragrance. Texture ~ It has a smooth texture, glides on easily and applies evenly on lips. They don't feel heavy on lips even if layered. Pigmentation ~ Both the lipsticks are not very pigmented but can be layered to get an even finish. Finish ~ The lipsticks, as the name suggests, have a velvet matte finish. Meaning goes on smooth, creamy but still appears matte. It stays for 5-6 hours. Needs touch up after a meal. Fades evenly and leaves a nice tint behind. The lipstick does not feel dry and also does not accentuate lines or dry patches. Packaging ~ Comes in a gorgeous black and gold matte packaging just like the lipsticks, very chic. It has a see through centre and bottom to identify the color. Color ~ When I think of Lilac and Orchid, shades of purple comes on my mind. Gong Li’s Lilac looks light coral to me and will look flattering on lighter skintone and Katrina's Orchid is a gorgeous hot pink color. Fragrance ~ The Extraordinaire Mat Lip Color smells like roses and I really like it. Texture ~ It has a smooth texture, glides on easily and the applicator applies the lipcolor evenly on lips. They don't feel heavy on lips even if layered. Pigmentation ~ Both the lipsticks are quite pigmented and can be layered without looking messy. Finish ~ The lipcolors have a semi matte finish. It stays for 4-5 hours. Needs touch up after a meal and fades evenly. It does not feel dry and is moisturizing. 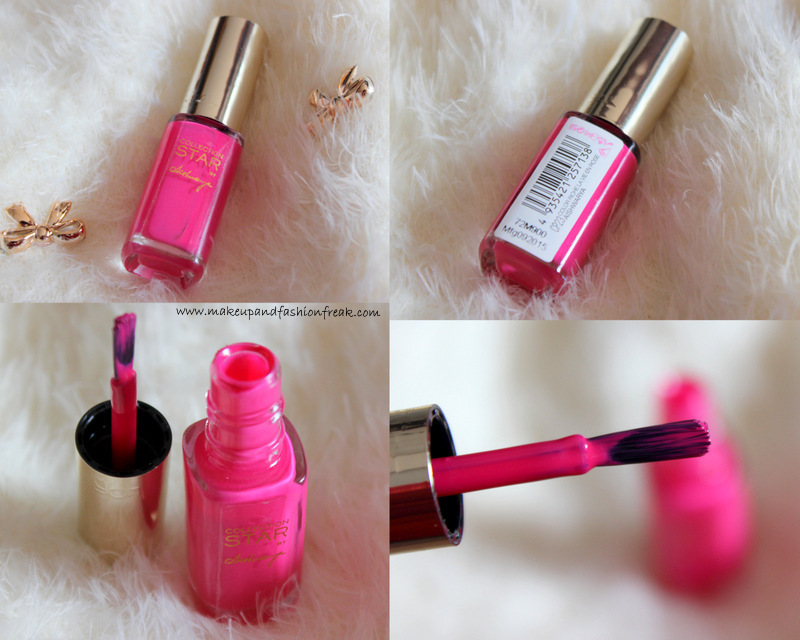 The Color Riche La Vie En Rose Collection Star Nail Paint comes in a small glass bottle with a golden screw cap. The brush applies the nail paint evenly. 2 coats are enough to get an opaque finish but I prefer 3 coats. Aishwarya's is a Hot Pink color and looks really pretty. The nail paint starts fading from the edges after four days and I am really impressed with its staying power. Overall, I am in love with the collection. I am sure there is at least one pink lipstick/lipcolor in the collection meant for you. My personal favourites are JLo's Delicate Lipstick and Katrina's Orchid Mat Lip Color. And I think all the three nail paints are really pretty and worth trying. That's it guys. Hope you liked the review, swatches and the pictures. Do let me know your favourites in the comments below.